I’ve never been much of a book borrower, that’s about to change, because Ashfield Library has entered the 21st century! The books automatically disappear at the end of the selected loan period (7, 14 or 21 days) and the interface works in a similar way to the Kindle app, minus a few bells and whistles. Heaps of public libraries all over the world now offer these services, so if it’s been a while since you joined one and you’re an e-book lover like I am, then I highly recommend you check them out again (no pun intended). You’ll be able to access a world of reading without paying a cent or ever leaving your house again! His granola recipe is easy to make, uses just a tiny bit of added oil, and was very popular with Big Boy, the toasted muesli eater in our house. I’d advise sizing up, as the quantity we made lasted less than a week! Malouf recommends pistachios, sour cherries and currants, but we used 100g of roasted blanched hazelnuts and 100g of cranberries. Step 1: Preheat oven to 150C. In a large bowl, mix together the oats, sunflower and sesame seeds, almonds, sugar, salt and spices. Step 2: In a small jug, whisk the apple with honey, molasses and oil, then add the liquid ingredients to the dry ones and mix well with your hands. Step 3: Tip the mixture into a large baking tray and spread out evenly. Bake until deep golden brown (45 – 60 minutes) stirring every 20 minutes or so to prevent burning. Remove from the oven and stir in the hazelnuts (or whatever nuts you’re using – add them in the last ten minutes of cooking time if they need toasting), then allow to cool before adding dried fruits. Store in an airtight container, although it’s so delicious that it probably won’t have time to go stale. This tangy and spicy granola makes a nice change from regular toasted mueslis. 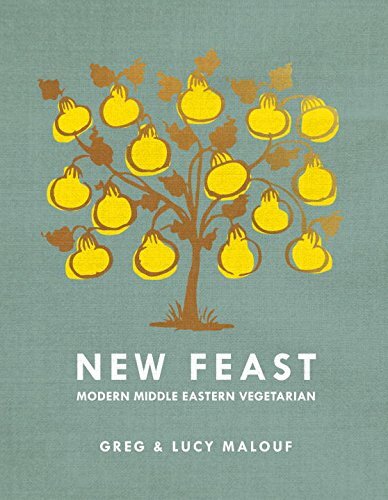 What a treat to be able to borrow such a gorgeous cookbook, full of photos and hyperlinks, and not have to worry about returning it on time, as it disappears automatically at the end of the loan period. Hooray for 21st century public libraries! Are you a library user as well? I remember the first time I set foot in that little country library ♡ I’ve always had a library card somewhere or another but not here locally yet -not really necessary but maybe one day- as I’m still running on my City of Sydney membership for Zinio magazines. I must check if the e-book access is still active. I love my public library, and borrow books regularly. As well as ebooks it has audio books ~ is that something you would like to check out at yours? Mine has movies you can borrow too. I haven’t used it yet, but it’s a great idea. Enjoy your reading!! I’ve had a library card for over 50 yrs. It’s a resource we should all use as often as possible or, with municipal cutbacks in many areas, reduced attendance means more branches will close. Furoshiki is a long time method of conservation … reduce/reuse/recycle. And it’s a pretty cool way of transporting stuff. Thank you for sharing your granola recipe…yum! I love the library and visit our local branch almost every day. We are so fortunate to have such a bounty of books to choose from – for free! I LOVE my library ‘card’ :) Good for you re discovering this wonderful resource ! I started making toasted muesli based on an internet granola recipe for a Christmas breakfast over two years ago and we haven’t stopped eating the variations once we tasted the difference. So easy to do, but get a big bowl! I make extra to share and end up doing about 5.5kg per batch at about $60 cost per batch using organic ingredients. But on a per serve cost it is an excellent value breakfast meal and keeps well in an airtight container for 4 weeks at least. I’ve had a library card for most of my life. I adore zinio as well as Overdrive and make good use of both. We just went to the local library yesterday. I love the smell of books and the flick of the pages. But I don’t mind my Kindle either on occasions where I don’t wish to venture out to the library. My almost 13 yr old loves the outing as he gets to choose a book and half read/half sleep in the cosy environment! I NEED to make Granola but without all the brown sugar. My pantry is always well stocked with a variety of nuts (not to mention the human kind as well haha) so I’m off to explore, modify, invent! I too have discovered the library – it’s great because if they don’t have the book I want, I can order it and I get an email when it is ready for me to collect. It’s wonderful for me because I want to curtail my cookbook acquisitions until I move house. I am so pleased that you have rediscovered the library. I was taught to read before the age of four and can clearly remember my first visit to our local library. I felt as if I had been admitted to Aladin’s cave and that feeling has never left me. When I come home with a bag full of books and start reading the first one it feels better than the biggest box of chocolates! Have you tried borrowing eaudio books from Bolinda’s Borrowbox which is accessed through your library? I put the audiobooks onto my iphone and it makes the worst chores disappear in no time. I even look forward to using the vacuum clearner as I don my noise cancelling headphones, attach my iphone which I have suspended around my neck in a purpose made bag and away I go. Hi Celia, now I am a Country Girl I intend to join the Bridgetown library. We will see how it measures up. We love our library – but then again I am married to the son of librarians and he has always loved borrowing – lately we have borrowed lots of dvds. I have not got into ebooks but I like that libraries make them available too. We have wonderful library in Turner Valley Alberta that besides everything to do with books you can borrow tools, hiking poles, snow shoes,bikes and a hiking group that you can join! I also make granola on regular basis but us coconut oil and honey as the glue to combine everything. Do you have a stash of tinned apple baby food? I would never have thought of that. I use Zinio for emags from the library, though annoyingly they chop and change the titles available but our ebooks were a bit limited last time I looked. Maybe I should try again. I still visit the library regularly and just love walking about with a stack of books to read without it costing a penny. The granola looks delicious! I haven’t made granola in awhile, but should again. Could I reduce the sugar if the applesauce is too sweet? I do have unsweetened applesauce as well. I love going to the library. I borrow all sorts of books; I never knew they were online though! I love listening to audio books and I do borrow the odd movie/dvd. I love your blog and am particularly taken with this particular post. I have a blog that focuses on word play and library features. I am a retired federal (U.S.) librarian of over 30 years and currently volunteer for the USS Midway Museum Library. I would like to share this blog on my blog, https://equipsblog.wordpress.com/ as a library feature. I would like to start with a brief lead-in about you and then provide the unique link directly to this blog post. Would you mind if I did that? I do miss Ashfield library, having moved to Razorback last year. But I’m loving the local library at Picton! Such a great little place pack with treasures!! I am also not much of a library goer, at least not since the bedbug scare hit. But ebooks is an entirely different kettle of fish. What a great idea. And I have pinned the granola recipe. I recently saw one using pumpkin puree in much the same way you use applesauce. I thought it was an inventive spin for fall weather. I am a big library user. I love borrowing real books more than ebooks, though the latter are great for travel and guide books too. One library, the Moreland library, has a huge art and cookery section and I come back from there with arm loads. I love being in the physical space of a good vibrant library- people at communal tables learning foreign language together, newspaper and magazine readers huddles in comfy chairs, engrossed students found entranced in an art book seated on a small stool amongst the shelves. I love being in them and borrowing based on my sensory overload and love of the physical object. By way of contrast, the other library I sometimes visit is the Nillumbik library where no service is available and the shelves are shrinking daily. This library has gone the ebook way, which is fine, but at the cost of real, lovely books to borrow. I’ve now stopped going to that one. Always jam packed with interesting info … Finally bought. BIG bag of Wallaby high protein flour .. 5 kilos … So Sour Dough here I come !! The day I discovered Overdrive from my public library was a great day too! Unfortunately, I find it a bit distracting since now I can have the books I want to read available to me instantly (except for when all the copies are loaned out of course). My parents were huge library users, me, not so much. I love the magazine option, I stopped buying magazines years ago for the waste reason. Celia, I love your shared granola recipe and also your thoughts on modern day libraries complete with a Peanuts cartoon! I grew up on card catalogs and the Dewey Decimal System — plus the Peanuts gang and Doonesbury. Loved your thoughts on no more “recycling magazines”, too — recently I tore up a subscription card offering an “inaugural” periodical after I thought through the ramifications of what to do with the past issues. My kids don’t want ’em and I’m trying to minimize clutter! Yay for libraries offering the speed and convenience (and less waste) of online. Love ya, girl! I have the watermelon, want to come wrap it for me?! A for,the National Geographics we have 2 bookcase full, dating back to the 1940s. I can’t get Josh to part with them! I did at least get him to stop his subscription years ago. I lived at the library as a youngster – read so much that my mom petitioned the library to allow me an adult card so I could check out anything. We had summer reading contests – read a book, report to the librarian and get a sticker for your card. My absolute favorite thing to do. Once I had kids, we spent many hours at our local library and I read to them every night. One of my boys takes after his dyslexic dad so we learned about books on tape. I’ve used Overdrive, Kindle books, Audible. For some reason, magazines are harder for me in the digital format. http://www.compoundchem.com/2014/06/01/newoldbooksmell/ might explain why we love cooking and books! I’ve been a fan of borrowing e-books and magazines from libraries for some time now and really need to check out the magazine possibilities. I do still enjoy a real book – and do prefer my cookery books to be physical copies – but there is great value to be had in a virtual library! Meant to say e-books and audio books.